Global Keratin GK Hair Deep Conditioner 200g/7.5oz - Just Beauty Products, Inc. This in-salon professional treatment Global Keratin Hair Deep Conditioner delivers moisture and nourishes hair for a smooth and sleek deep treatment. Strengthens hair weakened by chemical services, heat styling and environmental effects. This in-salon professional treatment delivers moisture and nourishes hair for a smooth and sleek deep treatment. Strengthens hair weakened by chemical services, heat styling and environmental effects. Repairs damage with natural plant extracts and oils. Dramatically protects and restores the hair because of its concentrated dose of JUVEXIN. JUVEXIN is the only protein compound scientifically proven to protect and restore hair back to its youthful state. It nourishes and transforms hair inside and out to provide beautiful, smooth, healthy hair every day, with less time devoted to styling and maintenance. Can be used after Global Keratin Hair Taming system. 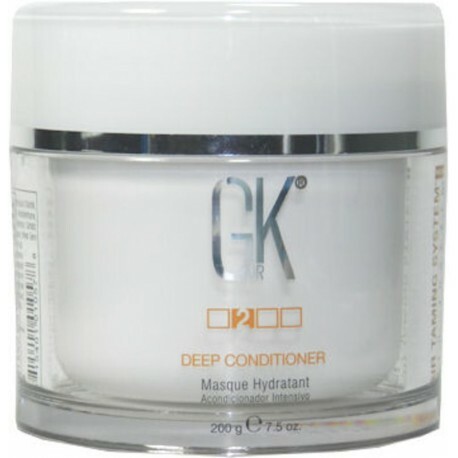 Step 1: Wash client's hair with GK pH+ Clarifying Shampoo, if client has experienced the GKhair hair taming procedure, wash with GK Balancing or Moisturizing Shampoo. Step 2: Apply to wet hair, coat the hair evenly, leave on for 20 minutes with cap under the dryer. Step 3: Rinse well, style as desired as you feel the transforming results.